Why I Started Blogging - Should You Start, Too? I am sure you have heard all the crazy success stories. Bloggers that started a website as a hobby that snowballed into a full fledged business. It sounds pretty good, doesn’t it? Some people hear those stories and become motivated to start a blog of their own. Well, having been there and done that, I can share my story with you. Maybe it will help you make your decision. I started a blog because it seemed like a great business that I could start from home for under $20. Fast forward to 2018 – 11 years. My oldest son has long left the elementary school he was in at the time and is now a newly minted college graduate. I SPENT a lot of money and a lot of time – but until recently, the most I made was a few hundred dollars a month. When I started blogging, I had none of the above. So, over the years, my approach to blogging was very inconsistent. There were some months where I put in tons of effort, and others where I wrote nothing at all. The topic of my blogs changed, my hosting changed, my themes changed – but the only consistent thing was my inconsistency. In addition to the concrete costs associated with blogging (which was way more than $20) there was also the opportunity cost. Every minute that I spent working on my blog was one less minute that I could have spent doing something else – like enjoying time with my family or working outside the home. But I stuck it out because I was hooked. I wish I could tell you that I saw the light and things turned around but that wouldn’t be the truth. Back when I started, blogging was new and technically difficult. All the drag and drop stuff you see these days, just didn’t exist. My first blog was hosted on the free Blogger platform and it was UGLY. Being a newly recovered perfectionist (raising kids will do that to you), I spent a ridiculous amount of time learning to code html and then CSS – just to make my blog look a little less ugly. Once in awhile one of my posts would take off. Then I would waste time obsessively check my stats, instead of creating new content. It was nuts but it wasn’t profitable for me for a long time. Absolutely. But I would do it very differently. A few years ago I took a very expensive business coaching program. I was looking for answers to all my confusion. In one of our group sessions, this business coach looked at me and said “I looked at your website but … I can’t really figure out what you do”. It was like a slap in the face. I was looking for help from this person who had helped so many people grow hugely successful businesses – and she couldn’t even figure out what my business was about. Clearly, I had some soul searching and lots of work to do. You would think that I would have put my blinders on, put my nose to the grindstone, and whipped my blog into shape. Instead, I thought that maybe this business coach just didn’t understand what a “lifestyle” blog was all about. Maybe she didn’t get that business model. Thankfully, I decided that I needed coaching or training specifically about blogging. In 2015 I found and enrolled in Elite Blog Academy (EBA). Again, I wish I could tell you that the rest was history – but I cannot. However, I can tell you that enrolling in EBA is one of the best things I ever did for my blog and my business. 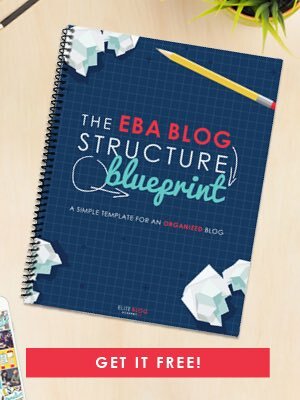 Back in 2015, even though I signed up for EBA, I thought I knew everything I needed to know about blogging. I worked through the units and did the homework but I didn’t change my mindset towards blogging. I wasn’t open to what I was hearing. And guess what? I kept doing the same old thing and hoping for different results. My income did increase as a result of EBA, but it wasn’t going to pay the bills. Because I am such a slow learner (or just a little dense) it finally dawned on me that I had to do things differently. Today I am starting EBA all over again – with new focus and new direction. I have seen first hand how Elite Blog Academy has changed the lives of so many new bloggers. The ones that follow the program step by step and stay focused are the ones that succeed. Are they smarter than everyone else? But honestly, I think it all boils down to organizational skills, focus, and perseverance. If you have those – and the willingness to learn – then blogging can be a great income stream for you. If you don’t have the organizational skills, then follow along with me here as I share with you what I learn. Also, if you have been blogging for awhile, tell me about some of your challenges in the comments. Are you where you want to be? Has the journey been hard, or easier than expected? Ah Neena – How familiar your story is to me. I’m currently on my 3rd try at trying to come up with a topic that is cohesive, focused to a distinct group and still is what I can and want to write about. I too, thought I could write about what I wanted to and found out it doesn’t work that way. Everyone talks about making money blogging but some topics are really hard to come up with a product that relates to what I’m writing about. Should I change topics again to find one that will be profitable? Still thinking about that. Wishing you well. I feel your pain and frustration. Yes, I suppose it is a universal blogging challenge. Finding the intersection of what you want to write about and what resonates with your audience. I am trying to dial it in a little and find a common theme – the more I write the easier it gets. I think the act of writing daily is helpful because I sort of continue the conversation from what I was writing the day before, if that makes sense. Good luck to you, too, with finding the perfect niche!